Size of Male: 20-30 lbs., 18 in. Size of Female: 20-30 lbs., 16.5 in. Color: Numerous tan shades, from reddish brown to cream; black, chocolate brown and grey. White is always paired with the predominant color. Friendly, playful, and full of curiosity, the Icelandic Sheepdog is the only native breed from Iceland. They made their way to Iceland with Vikings in the later part of the 9th century and quickly became indispensable to the island people. Also known as the Iceland Sheepdog, this breed was used to work sheep, cattle, and horses. They are very loving and patient with children and they make an ideal family dog. 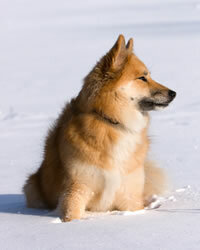 The Icelandic Sheepdog is probably related to the Norwegian Buhund. The dog is also genetically related to the Finnish breed, the Karelian Bear Dog, which originated in Russia. They are a Nordic-spitz type dog. Whatever the case, Viking and Scandinavian settlers brought small herding dogs with them when they settled in Iceland around 874-930. The dogs adapted their working style to the local terrain and farming methods, eventually developing into this Iceland dog breed. The dogs became indispensable to the local farmers and were used to herd sheep, cattle, and horses. In the 19th and early 20th century it was feared that this dog breed might become extinct, but the breed’s numbers have increased in recent decades due to efforts by concerned breeders. The breed is also known as the Iceland Spitz, Iceland Dog, Friaar Dog and Íslenskur Fjárhundur. They have been called “the dog of the Vikings.” The breed was recognized by the AKC in 2010. The Icelandic Sheepdog is a playful, inquisitive dog who is very friendly. They are tough dogs, as they needed to be to do their work in a country as rugged as Iceland, and they are highly energetic. They herd by barking and driving livestock. They are very alert dogs and they will always let you know when someone approaches, though they are not aggressive. Iceland Sheepdogs usually love children and get along well with other pets. This is a dog breed that likes to have some work to do. Otherwise they may become bored and could be destructive in the house with their high energy. Dog training is recommended. Living Environment – The Icelandic Sheepdog is not among the best apartment dogs because of their barking. They bark a lot. They are also very active dogs and need lots of exercise. They prefer to be close to family members and it’s best if there is someone who can be home with them most of the day. They enjoy living a suburban or country lifestyle. Grooming – This medium dog breed has two different kinds of coat. Both coat types have a thick, weatherproof double-coat. One coat type is short-haired. The outer coat is medium length and reasonably coarse, and the undercoat is thick and soft. The breed’s tail is generally busy and the length of hair is in proportion to the coat. The long-haired dog has an outer coat that is longer, fairly coarse, with a thick, soft undercoat. The tail is very bushy and the hair length is in proportion to the coat. The coat requires regular maintenance brushing. The dog sheds his undercoat twice a year and you will need to brush more often to prevent hair from falling everywhere. These dogs do have rear dewclaws which need to be kept trimmed, along with regular trimming of the other nails. Clean the ears regularly to prevent infections. Diet & Exercise – The Iceland Sheepdog requires a normal healthy diet. They are a very high energy dog and require a great deal of exercise. They should be taken for long runs to help release some of their energy. Health – Coming from a rugged working population of dogs, this has been a healthy breed with very few dog health problems, although almost 75 percent of the breed in Iceland was wiped out by canine distemper in the 19th century. So far, only a small number of Icelandic Sheepdogs have had OFA results reported, but that number should increase in the future, which will give a better picture about the dog’s orthopedic and genetic health. As a herding dog, the Icelandic Sheepdog is intelligent and able to think for himself. He can also bond closely with his owner and has a strong desire to please. These traits can make dog training relatively easy. The Iceland Sheepdog has done well in agility trials, obedience, rally, flyball, tracking, and, of course, herding events. These dogs can have issues with separation anxiety so it’s recommended that they are well-socialized as puppies to help them become confident and outgoing as adults, and so they won’t be afraid to be left alone at times.